As I was preparing dinner Saturday night, I couldn't help but notice the intricacies of the inside of the green pepper I was slicing. I was so intrigued by the bright, fresh color, the tightness of the seeds, the emptiness of the middle and the texture in the outsides. That was that: my next photo subject, hands down. This shot proved to be more complex than I thought it would be. 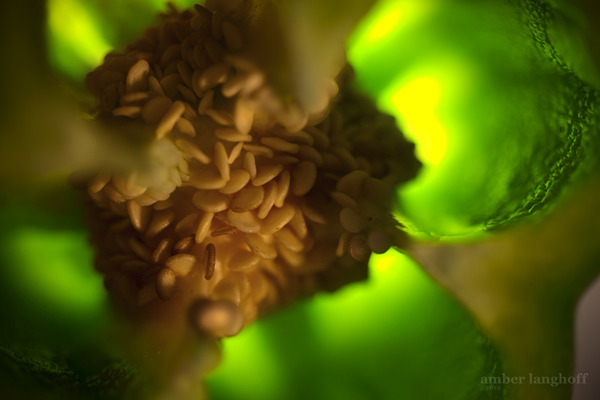 I haven't experimented with my macro lens very much, but I really wanted to capture the tactile features of this fresh fruit (yep - poor guy is commonly mistaken for a veggie). I positioned a few lights around a couple different peppers with some white reflectors and challenged myself to look at them differently than most would. After experimenting and fiddling around with the set-up for a while, I started to love the way the light would shine through the outside to illuminate the textures & colors. I like the way the focus goes in and out in shot on the top with the brilliant colors (looks a little surreal), and the freshness captured in the shot on the bottom with the light shining through it as well. there was a party in heaven!